The contest theme for I Heart Faces this week is "Play." Perfect for a session I'm currently working on. These two brothers had a ton of fun PLAYing super hero. The little one did a good job keeping up, too! Thanks! It was fun chasing these two! Such a classic photo, very well done! I love the action. Love this!! Such a cute shot! 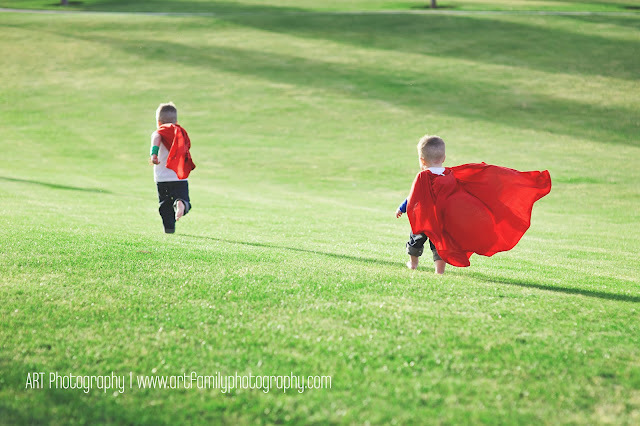 Love those red capes blowing in the wind with the bright green grass - perfect!